For a big handful of duplicates! Manage your small fleet of ships with movement maps. While your pirate ship chases away merchants to steal goods from them, merchants try to escape from you to deliver their cargo to friendly ports. 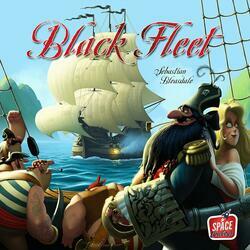 Players also lead frigates that hunt down pirates. With all the good or bad doubloons acquired by these different actions, you will develop your fleet and offer it new capacities. A luxurious material with superb boats and metal doubles. Mechanisms that are quick to explain, but allow spectacular combinations. Each part is different thanks to the multiple development cards.